Happy May Day! It’s a holiday here tomorrow, so we are enjoying the long weekend puttering at home. 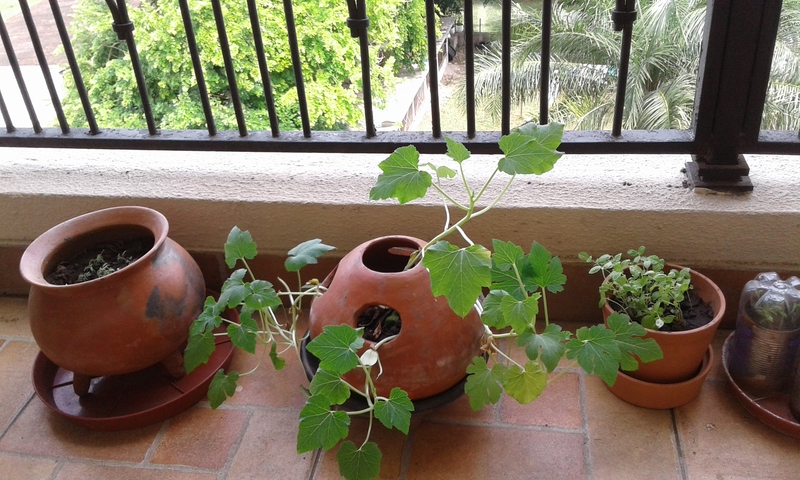 I am trying out various seeds on our balcony: here, tomato, zucchini, basil, and lettuce. With 35C in the shade there in the afternoons I suspect it’s on the hot side for the seedlings, but I have optimistically planted rughetta, bietola, celery and mint today in plastic egg cartons. We shall see. Another hot day here. The short rainy season is delayed, so we will see what it’s like when the rains set in for earnest in the next month or two. There have been some downpours, so trees and shrubs are finally beginning to blossom: orange yellow, red, and highlights of bright pink bougainvillea. Meanwhile my husband has been busy. Most of what we find in shops here in Accra seems to be imported, often from South Africa. Fair enough. When we first arrived I bought an iron in Game (South African shop) at Accra Mall, thinking I’d need it for office wear. Five months in, no ironing done yet, since a) it is just too much effort in the humid heat, and b) the iron we bought had a South African plug. So anything linen just remains wrinkled. 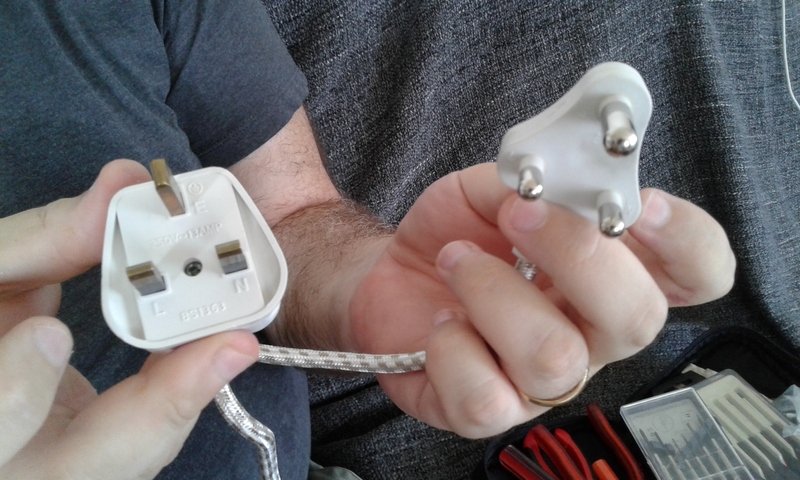 See below: left is the Ghana/UK type electrical plug, on the right, the South African electrical plug – and the latter fits none of the sockets in our flat. Today my lovely husband swapped plugs, so now I have no excuse. Good to have a functioning iron, just in case — I live in fear of mango flies, which lay eggs in damp laundry and which can actually hatch in your skin. Not dangerous but nasty, so we should really be ironing everything – sheets, underwear, and all. Many houses here have dryers, to avoid hanging laundry out, but we are managing so far with daytime drying on the balcony, followed by 48 hours quarantine before wearing anything freshly laundered. There are however many good things about living in Ghana, like the fresh mango and pineapple. Most of the pineapple here is amazing, very sweet and juicy. One this week was just OK, and we tossed together this cake to use it up. The oven was on for making Friday pizza and homemade granola, so a quick cake was added. Electricity is so expensive, so baking is a tactical/financial decision! 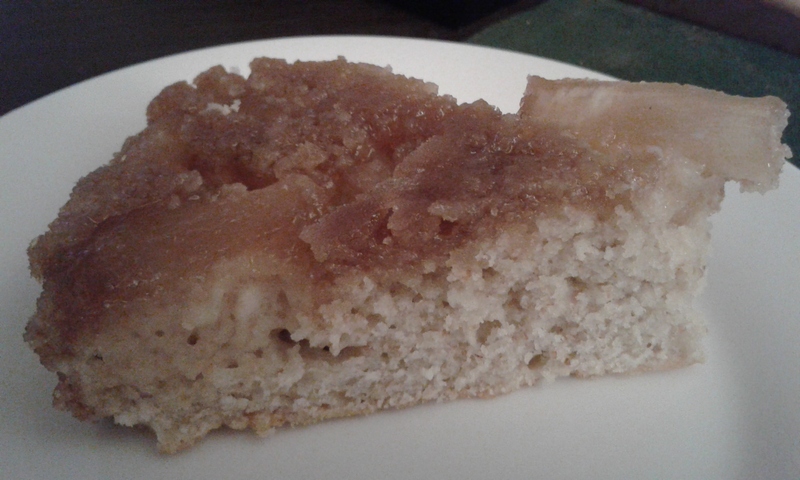 This cake was fine, not amazing but hey: oven-warm cake is nice anyway! Sorry about the photo – with the sunset just after 6PM, photo conditions are not optimal here. Heat oven to 180C/350°F. Pop 24 cm cake tin in heating oven for a couple minutes to soften butter and grease tin. Spread butter over cake tin base, and sprinkle brown sugar evenly over the butter. Arrange chopped pineapple pieces over brown sugar. Separately, mix the other ingredients together (flour, eggs, milk, baking powder, salt, oil). Pour batter over pineapple pieces. Bake 50 minutes at 180C until the cake looks golden, and a cake tester comes out clean. Carefully invert cake onto serving plate. Cake will be steaming and very hot. Notes: next time I might add some very finely chopped pineapple or pineapple juice to the actual batter, the cake was just a bit dry. Maybe a bit more butter in topping as well. The cake rose more than I expected for the tin size, and the topping was very nice, more pineapple taste than caramel. The cake was still very nice cold the next day. We had it fridge-cold, as the ants here are so ferocious that a lot of food is kept in our two fridges here. You think your containers are air-tight, until you meet Accra ants…… Anyway, a leftover slice slightly reheated in microwave would be nice too. This entry was posted in baking, food, fruit and tagged cake, living in Accra, pineapple on May 1, 2016 by krumkaker.